The undergrowth is seasonal, and these rains during this season have made it nice and green in the Tortolita hills. There are the places that act as a protective mother and nurture plants. 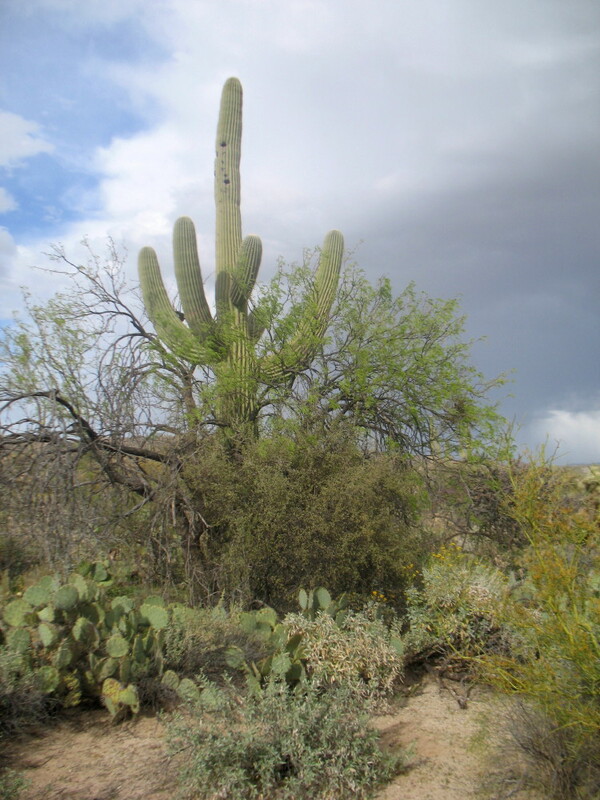 The vulnerable young saguaros during the first five to 10 years require a mother. These safe places hide the bunnies, quail and most everyone else. The most prolific, the “islands of life” are under the low branches of the mesquite and palo verde “trees.” I don’t even think about destroying, or even hassling with going through those masses. They are precious. Other than these, there is undergrowth under any shady place that has accumulated the treasure of soil. An Island of life near the trail. This mesquite and hackberry began the nurturing of this saguaro well over one hundred years ago. Out on the trail, here are patches of taller grass. This project has given me opportunity to dig out invasive species like the bufflegrass. 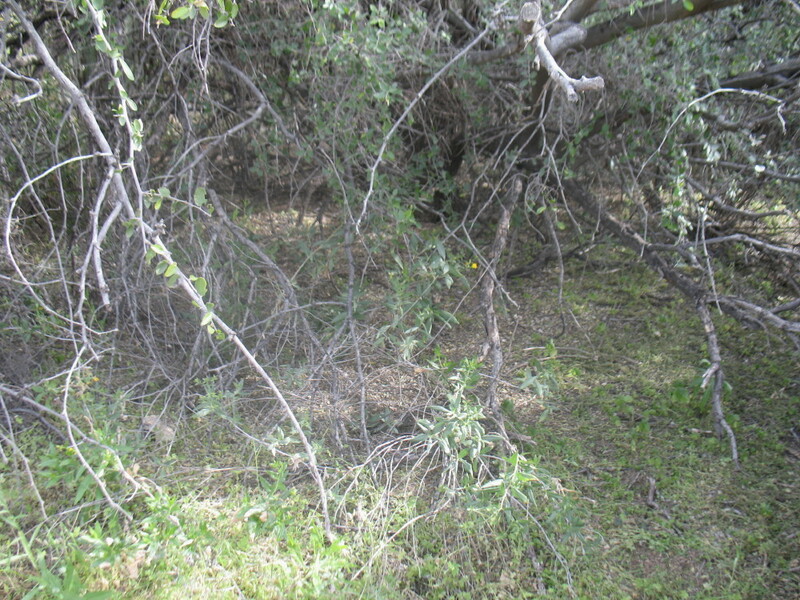 Any one of these shady spots under any bush is a potential resting place for a rattler, during their seasons. Any bush that I step next to and don’t look under first has that potential for catastrophe. I have been making this subtle trail where there is wider expanse between the bushes and cactus, so as to walk safely. It has required me to trim some bushes back. They will grow back in time. No doubt, I’ll have to maintain this trail. Low hanging branches protect life. Everywhere there are prickery remnants lying about and I’m brushing them off of my path with a broom. With these little landmines gone, I don’t have to concentrate on them, instead I can put my attention to potential rattlers and enjoy my many other awarenesses. I will have more opportunity to look up and out across vistas, into azure skies and clouds. At the same time, I am making a system of cairns and landmarks to make it difficult to recognize as a trail. These markings will be known only to me. 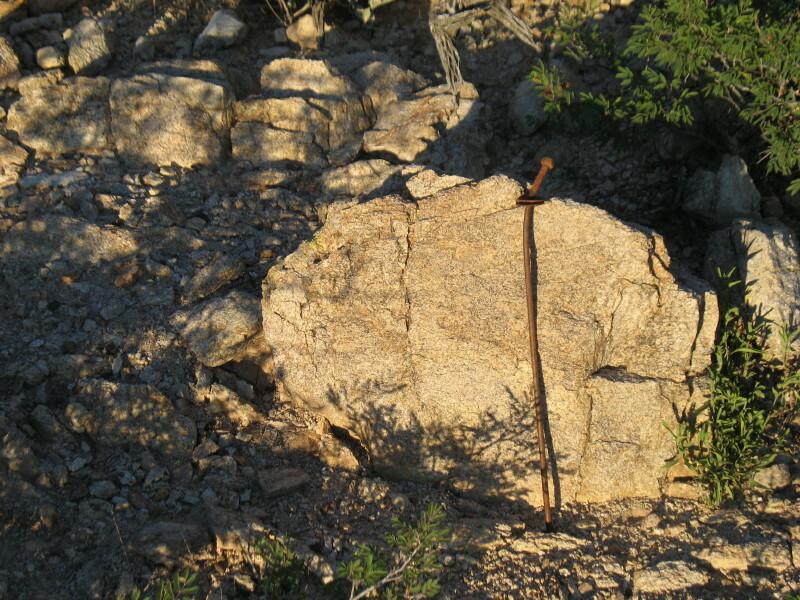 An old skeleton of a cholla branch here, an odd rock there, a piece of old carpet shows me a bend. It is a very winding path. Some bushes have no leaves, but will be thick at monsoon time, so I have to trim now. The catclaw acacia has been vicious. These don’t let anyone brush by. They reach out with hooks and grab anyone passing, refusing to let go. The smaller see through bushes are left to be simply stepped over. This is to be a safe path through rattler territory. Finding the best route has shown me the impressive richness and diversity that is here. Even the pink and purple mineral quartz, copper associated rocks, and colors in the granite are diverse. There are spaces with seemingly no vegetation, but when rains come, I’ll find many dainty plants. Some biannual, some during the monsoon’s summer rains, some during winter. I have roped off 15 foot square sections and found twenty-five and thirty plant species in each one, as I watch over a couple of years. The Forest Service told us that this desert is the most biologically diverse area in the state. There will always be a surprise along the trail, a small miracle, or wonderment.